As any Collision Industry Conference event starting late will tell you, the auto body community likes to network. Recognizing that and noting some of the great discussion taking place on our Facebook page (Like it if you haven’t! 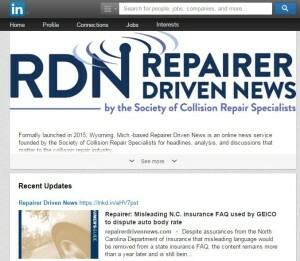 ), we’ve created a Repairer Driven News LinkedIn page for current and aspiring collision repair professionals to see our coverage and comment on some of the top news of the day. Follow us and join in the LinkedIn conversation. We and your peers would like to hear what you have to say. Also, in other social media news, we’ve added “share” icons for Reddit, StumbleUpon, and Tumblr below all articles, so readers who prefer those sites (there must be some addicts out there) can easily post our content. Get the Repairer Driven News app for iPhones and iPads in the App Store and get all the collision repair coverage you need on a convenient mobile platform, as well as real-time notifications for stories. If you like it, please give us a positive review. Sign up for our daily, weekly, or monthly email newsletter. Follow us on Twitter (@repairerdriven). Looking forward to having you join the conversation!